© 2004-2009 Dorothy “Dot” Matthews. All rights reserved. Use the Russian join method to join your scraps together and you won't have to deal with so many loose ends. RUSSIAN JOIN - weave one end of the yarn back into itself, leaving a loop on the end, thread the next piece of yarn through the loop and weave that end back through itself. Pull the ends to tighten the loops and trim off excess. Confused yet? Here's a couple of links with pictures to help you see what I'm talking about. Russian Join and Russian Join. This is by far my favorite way to join yarns. Black yarn for contrast and lots of scraps for color. K hook optional for foundation chain and J hook for pattern. With black yarn and a K hook, ch 170, switch to J hook. Row 1: work in bump on back of chain, sc in 2nd st from hook and in ea st across. Turn. Row 2: ch 1, sc in first st, *sc in next st, hdc in next 2 sts, dc in next 2 sts, tr in next 3 sts, dc in next 2 sts, hdc in next 2 sts, sc in next 2 sts. Repeat from * across. Change to color A, turn. Row 4: ch 4 (counts as tr), sk first st, *tr in next st, dc in next 2 sts, hdc in next 2 sts, sc in next 3 sts, hdc in next 2 sts, dc in next 2 sts, tr in next 2 sts. Repeat from * across. Change to color A, turn. Row 5: ch 1, sc in ea st across. Change to color B, turn. Repeat rows 2, 3, 4, and 5 to desired length. You can add a border of sc around all 4 sides of the afghan, placing 3 sc in ea corner stitch. That is a beautiful pattern! Thank you so much. Dot, I'm so glad I was able to find this today! 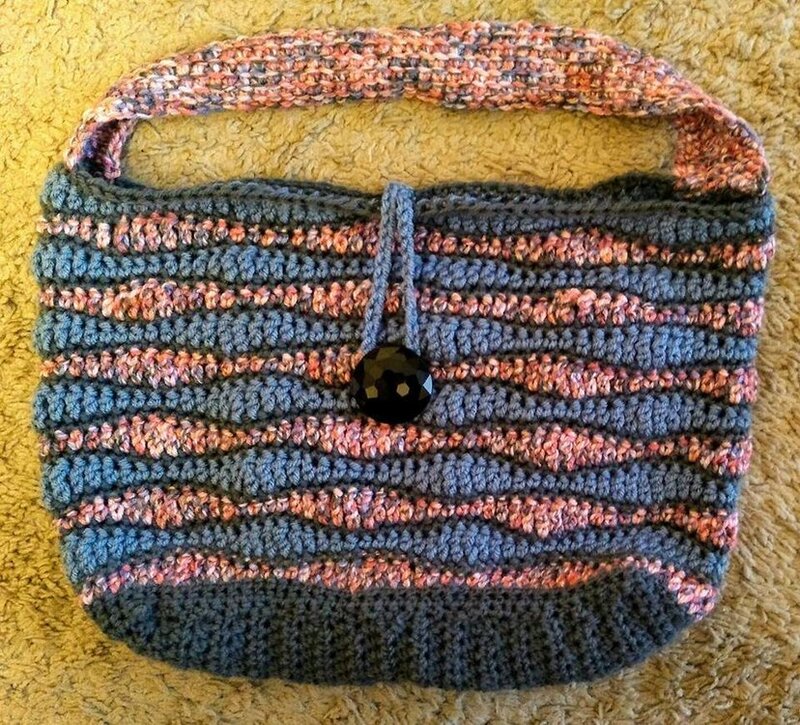 I started this pattern 2-3 years ago and absolutely love it to use up scraps. I put it away before moving and just found it the other day, and posted a pic on my blog yesterday for WIP Wednesday. I knew others would ask for the pattern, and I didn't remember where I'd seen it. I started poring through the afghan page at CPC and there you were! I'm glad I found it so I could give proper credit. This post links back here to your pattern. 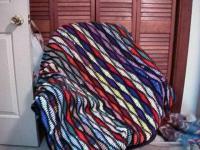 This has got to be by far the best scrap afghan project I have seen! Thanks for sharing. I have GOT to do this one!! Very nice. I'll put it on my list of things to do. Have so many scraps. I don't seem to have many scraps, I'm always using them for small projects & "tests". But this is so scrumptious I guess I'll just have to get more yarn!! I love this afghan. Thanks for sharing. 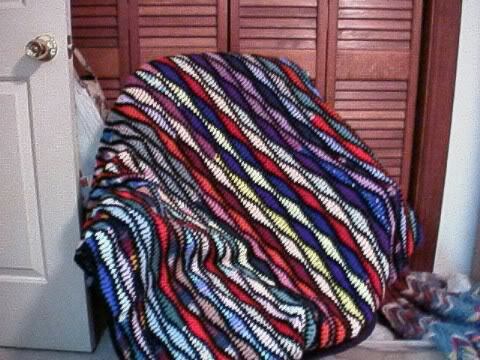 I'm thinking of making a baby afghan with this pattern. I hope it will help get rid of the scrap yarn that I'm drowning in! Did I just get...Did you just...you RICK ROLLED us!!! You are now my new hero!!! Love the pattern. 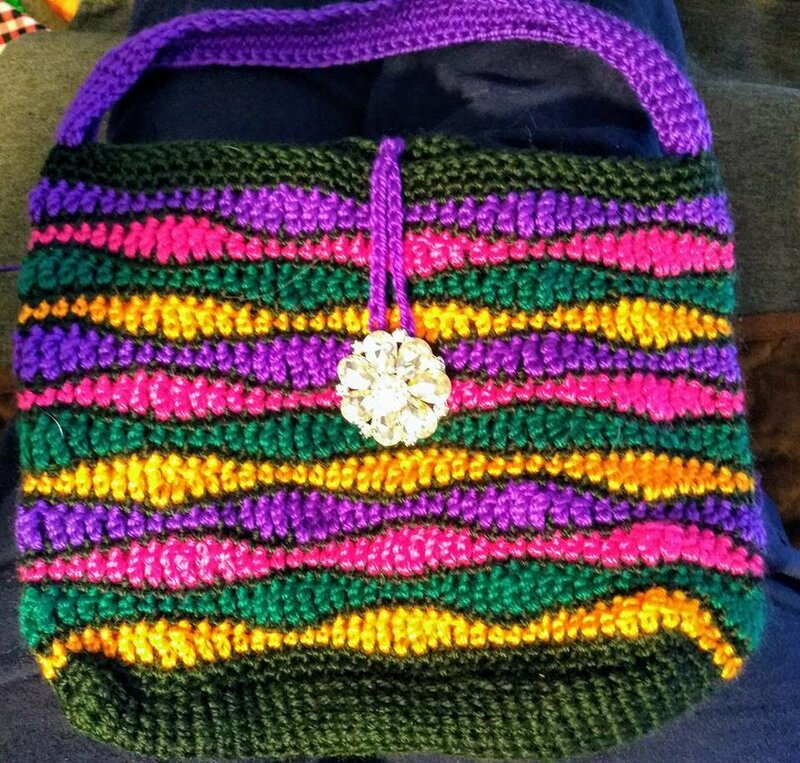 I adapted the pattern to do in the round to make purses. Great job. Those are really pretty.